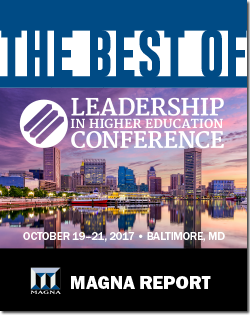 The Best of The Leadership in Higher Education Conference Report highlights some of the top-rated sessions and presenters from the annual Leadership in Higher Education Conference. As members of the academic community are tasked with greater accountability than ever before, effective leadership is a highly desired, competitive trait. The Leadership in Higher Education Conference puts the tools in your hands to develop professionally, exposes you to ideas and strategies that you can apply at your own school, and boosts your career progress.